Phillies pitcher Vince Velasquez throws the baseball in the first-inning against the Toronto Blue Jays in a spring training game on Wednesday, March 6, 2019 at Dunedin Stadium in Dunedin, FL. 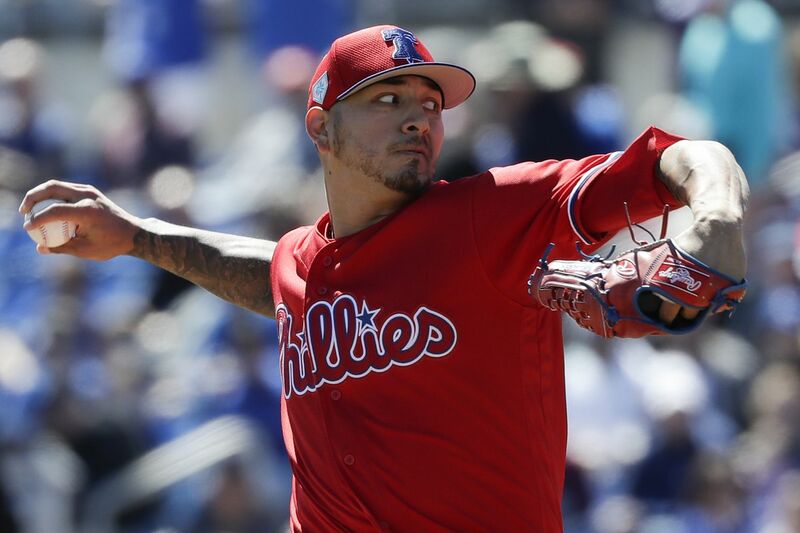 DUNEDIN, Fla. — After being traded to the Phillies three years ago, Vince Velasquez was given the chance to choose a new number. He had worn No. 67 and No. 41 with Houston, but only because those were numbers randomly assigned to him. Velasquez had worn No. 21 — “a family number,” he said — growing up in Southern California. That digit was free. Velasquez decided after last season that he would revert to No. 21 and he entered spring training with a new number above his locker stall. This season will be a crucial campaign for Velasquez, one that should ultimately decide if his future is in the starting rotation. And it started with a new number. For Velasquez, becoming a new pitcher meant more than just requesting a number change. He altered his mental outlook and worked this offseason to alter his pitching delivery, believing his simplified over-the-head motion has allowed him to stay centered on the mound and improve the command of his pitches. Velasquez made 31 starts last season but he finished with a 4.85 ERA and struggled mightily over the final two months of the season. The Phillies gave their starting rotation a vote of confidence this winter by staying out of the starting pitcher market after being outbid for Patrick Corbin. It will be the performance of Velasquez, Nick Pivetta, and Zach Eflin that will prove if that decision was right. Armed with a powerful fastball, Velasquez has matched great promise over the last three seasons with inconsistency. During that period, he has the 25th best strikeout rate among all starters. He lowered his walk rate and homer rate but a solid season felt wasted by the way it finished. The Phillies, if they do begin the season with the five starters they currently have lined up, could add a starter at the trade deadline if a need arises. Velasquez’s performance could either force their hand or allow them to stay the course. Velasquez’s old throwing motion began with his hands at his waist before he would raise his glove in front of his face. He then dropped the glove back to his waist as he turned his hips and then raised the glove again to his face before releasing the pitch. Velasquez unveiled his new look on Wednesday as he threw 27 pitches against the Blue Jays. It was simple as Velasquez centers his glove to his waist before lifting his hands over his head, adding a new wrinkle to his delivery. He then brings his glove back down and fires home. He wanted to work quicker on the mound and has already seen benefits with his secondary pitches. Velasquez said his father, Leonard, wore him out after he didn’t choose No. 21 after joining the Phillies. He told his dad he wanted to try something different. Velasquez has an old family portrait of him in a T-ball uniform, his two older brothers in high-school jerseys, and his dad in a men’s league jersey. All four are wearing No. 21. Before he took the mound on Wednesday for his first start of spring, the public-address announcer introduced him as “No. 21 Phillies pitcher Vince Velasquez.” Years after that photo, Velasquez is back to his old number as he tries to become a new pitcher. “The way it sounded on the speaker, it kind of rejuvenated me and made me say ‘You know what, this sounds right,’” Velasquez said.